£980 Price includes VAT and delivery. If you purchase directly from us and are not satisfied with your BikeErg for any reason, you may return it to us within 30 days of shipment and we will refund the cost of the machine. Every BikeErg includes our most advanced Performance Monitor, the PM5. The powerful PM5 provides repeatable, comparable data for every ride. The PM5 offers automatic “Just Ride” mode, or allows you to set up a variety of workouts. The monitor gives you a wide range of data, including pace, watts, cadence (rpm) and Calories and automatically stores this information. The PM5 uses power from 2 D-cell batteries whenever it is not being powered by the flywheel. The PM5 monitor on the BikeErg has both Bluetooth and ANT+ wireless connectivity, allowing it to connect to many heart rate belts, fitness devices and apps. The free Concept2 ErgData app helps you track your workouts and can sync with the Concept2 Online Logbook. 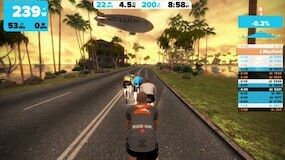 Third party apps, such as Zwift, can provide additional features to help keep you motivated. 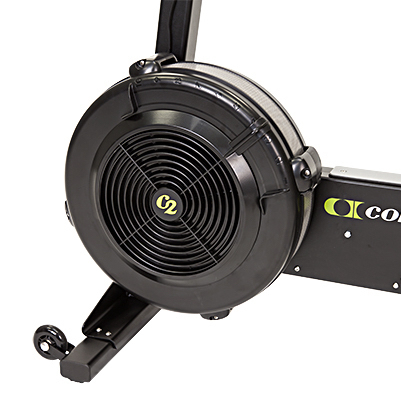 The BikeErg uses the same flywheel design as our indoor rowers and SkiErg to create a responsive, continuous ride. The flywheel puts you in full control of your exertion and resistance at all times. The damper allows you to quickly adjust the airflow to the flywheel during the workout. This has a similar effect to changing gears on a bicycle. Opening the damper and letting more air into the flywheel is like shifting into a heavier gear. Closing the damper lightens the "gearing". Both the saddle and handlebar positions are easily adjustable. You can set the saddle height with our secure and easy tool-free ratcheting system. The fore and aft saddle position and angle can be adjusted for custom fitting. The handlebars move up and down, and forward and back, and with three different handlebar riding options, you can easily find the setting that’s best for you. Prefer your own set-up? The BikeErg fits most standard bike parts, so you can easily use your own saddle, handlebars and pedals for the ultimate personalized experience. The BikeErg uses high-strength polygroove belts rather than a chain for a quiet ride. The belts are self-tensioning to help extend life and reduce maintenance. The BikeErg’s aluminum frame makes it both light and durable, while caster wheels make it easy to move around. At just 58 lbs (26 kg), it's lighter than most other stationary bikes. The BikeErg requires very little assembly and we include all necessary tools and clear instructions with lots of pictures. Our machines are well-known for their durability and construction. Tough and built to last, our machines withstand rigorous use in training centers, living rooms, hotels, health clubs and military bases around the world. We make sure our machines are easy to care for so you can focus on using your investment, not maintaining it. Power Requirement The PM5 takes two D cell batteries. During your workout, the monitor draws power from the spinning flywheel to extend battery life. Welded aluminum frame. Steel feet. How does the resistance of a BikeErg differ from a "spinning bike"? A "spinning bike" typically has a heavy flywheel with an adjustable (friction) brake. Once you adjust the brake, the resistance will be the same at any pedal cadence. This means you can set a low resistance and pedal at a high cadence or set a high resistance and feel that high pedal force even at low cadence. The BikeErg has a flywheel with fan blades, which cause increasing air resistance as the wheel spins faster and as the damper allows more air to circulate .The resistance you feel on the BikeErg is a function of your cadence. Simply increasing your cadence will also increase the resistance, similar to a road bike. Adjusting airflow to the fan will change the resistance you feel at a given cadence. Airflow is controlled by a simple damper lever on the fan enclosure. The result is much like changing the gearing. What is the difference between a direct drive connection (like a spinning bike) and a clutched flywheel as on the BikeErg? On the BikeErg you can stop pedaling and the flywheel will continue spinning due to the clutched system, just as when you are coasting on a road bike. The fixed connection of a "spinning bike" means the pedals will be moving as long as the flywheel is spinning. To end your ride, you either have to use the brake, or slow your pedal rate to slow the flywheel down before you can stop safely. Is the Performance Monitor the same on the indoor rowers, SkiErg and BikeErg? The PM5 on the BikeErg has the same functions and menu structure as on our indoor rowers and SkiErg. Like the indoor rowers and SkiErg, data from the Performance Monitor is repeatable, reliable, and can be compared to results from other BikeErgs around the world. Note, however, that a PM5 from a BikeErg would require reprograming to be used on a rower, and vice versa. Does the PM5 on the BikeErg show current speed (mph or km/hr)? Simulated speed is displayed as your time to travel 1000 metres. This time is comparable to the familiar pace number on the PM5 for the indoor rower and SkiErg. This means that the power (watts) required to achieve a pace of 2:00/1000m on the BikeErg is the same amount of power required to go at a pace of 2:00/500m on a rower or SkiErg. The difference of simulated metres traveled is reflective of the difference in real world speeds of the activities. Comparable effort is easily monitored between the family of machines. How does the damper on the BikeErg work? On the BikeErg, the damper is your “gearing”. Use a damper setting that helps you achieve your power and cadence goals. Higher power will be required to achieve a target cadence with the damper open (in the higher numbers). Decrease the power required by closing the damper (lower damper numbers). Do I fit the BikeErg? 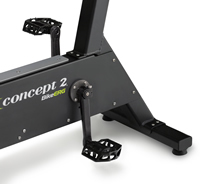 The BikeErg accommodates inseam lengths of approximately 27”–37”. For detailed sizing, see our Fit Guide. If your inseam is longer than 37”, please call Concept2 to discuss options. Is the seat adjustable front to back? Yes, if needed. The frame geometry is designed so that raising the saddle also moves the rider back, maintaining the correct relationship to the pedals. 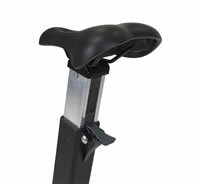 For general use, the saddle placement on top of the seat post will not need adjustment. For fine tuning the horizontal position and saddle angle, adjustments can be made using a 9/16”or 14mm wrench (not included). How can I mount a water bottle, smartphone or tablet to my BikeErg? We offer a water bottle holder (Part 2307, [prices:bikeerg-bottle-holder]) that mounts to the handlebars of the BikeErg. A smartphone can be mounted on the Performance Monitor with our Concept2 Smartphone Cradle. We are working on a tablet mount. It will be several months before this is available. Can I include BikeErg workouts in the Concept2 challenges? Concept2 offers motivational tools such as our logbook, challenges, and distance award programs. The BikeErg is now included in these programs. And we’re always here to help! Yes! Contact the authorized reseller in your area for pricing and availability.